We debated taking the train directly from Gent to Germany and skipping the last stretch of riding through Belgium. We were spoiled by the pleasure of riding in the Netherlands, and it was not as much fun to ride along busy roads in Belgium. However, we found a bike map that showed the route from Gent to Mechelen that avoided the busy roads, but it was longer since it followed the river. The ride was mostly along a bike path, so it was an enjoyable ride. We had a couple issues with our bikes, but this was the first time we’d had any trouble since the first day with all the flat tires. Jonathan got his first flat tire in Gent, but he had patched up the tire with our glue-on patches. However, we had barely gotten out of Gent when his tire was flat again. We were both frustrated because our Kevlar tires were supposed to prevent flat tires. The tires were a huge pain to get on and off, but once they were on, we should have had smooth riding. Just as Jonathan was about to put the inner tube back on the tire after patching it, he checked the tire for sharp objects causing the puncture and discovered the nail still stuck in the tire that had caused both flat tires. He removed the nail, and we had no more flat tires. I also had a problem with my bike cleats making my feet sore after riding with them for long periods of time. I finally figured out that the cleat on the bottom of the shoe was not adjusted properly. When I was pedaling, the cleat should have been placed where the pressure comes from the ball of my foot, but all the pressure was actually on the upper part of my foot and my toes. After adjusting the cleats, it was so much more comfortable to ride. We tried to make it to Mechelen today, but it was too far. We were completely worn out, so we decided to stop for the day. 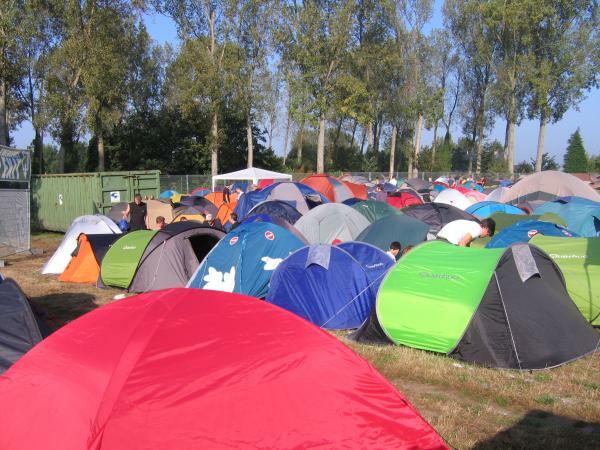 Unfortunately, Belgium has very few campgrounds, so the next campground was in Mechelen. We stopped in the town of Puur, and it only had one hotel that was expensive. It was our only option for the night without more riding, so we asked for a room. However, we did not know that there was huge festival in Puur that weekend, and all the accommodations in the area were completely booked. The hotel owners told us that they did have camping at the festival, so we thought that it might not actually turn out so bad. Then, we arrived at the festival campground… It was a huge field, and they were packing as many tents as they could into it. There were tons of people there bringing in lots of beer, so there was going to be wild party at the campground that night. Since we didn’t have any other option, we decided to camp there for the night. We had to wait in a long line just to get into the campground. They searched everyone’s bags for banned items such as weapons, drugs, and glass. They were mostly concerned about glass, and they had a huge pile of glass containers that had been removed from people’s bags. Once we got into the field for camping, we had to wait in another line. They moved a piece of rope every few minutes to open up another section of the field for camping. When they did this, the next group of people rushed onto the field to claim a spot to set up the tent. It was total chaos. We managed to get a spot for our tent, and we were packed in by all the other tents. We set up our tent, and then, we left the campground to get a little peace and quiet before attempting to get some sleep. We were starving, so we stopped at a pizza place. After our long day of riding, the pizza tasted like a slice of heaven. We returned the campground later that night, and it was relatively quiet since most of the people were at the concert. I managed to fall asleep, and Jonathan was surprised that I slept through some really loud noises. At one point, the generator for the super bright light in the field ran out of fuel, and everyone started cheering loudly. Someone else threw a chair into the dumpster for fun, and that made an incredibly loud crashing noise. However, I was woken up when our drunken neighbors returned from the concert. They thought it was the funniest thing in the world to scream “Oooooouga” at the top of the lungs. Every time I had almost fallen back to sleep, another idiot would scream “Oooooouga” again, but I finally managed to get back to sleep. The campground was surprisingly noisy in the morning. I thought that everyone would be sleeping after staying up most of the night, but they were up before us. Our lovely neighbors were up and still randomly screaming “Oooooouga” in the morning. They also had a radio station broadcasting live from the campground, so they starting playing loud music at 9am. Jonathan and I did not stick around long. We packed up and headed out as soon as we could.